Although we had originally intended to use earth for the living room, our experience of the relative fragility of adobe floors in other parts of the Roundhouse changed our minds. The last thing we wanted was to be worried about our guests causing damage with high heels and scraping chairs. 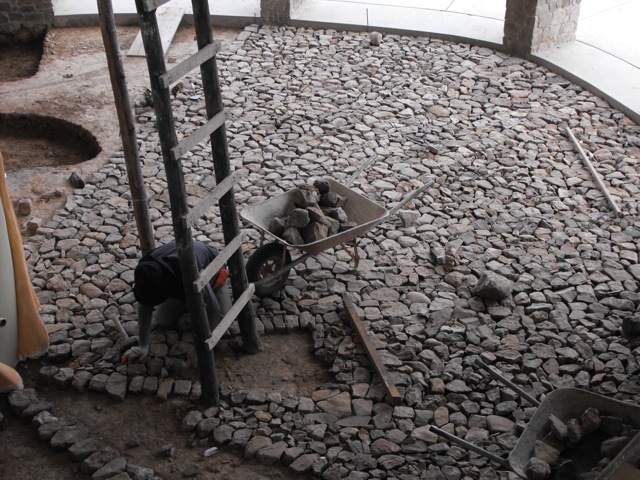 The decision was made to install a polished concrete floor that would stand up to heavy traffic. 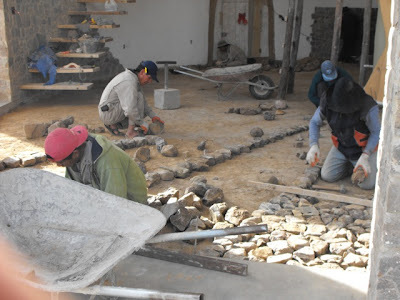 After bringing in small stones and dirt, which had to be tamped down using home made concrete tampers, the complicated process of laying the stones over the huge expanse of the living room was begun. Each stone had to be selected, chipped to fit and hammered down into the earth. 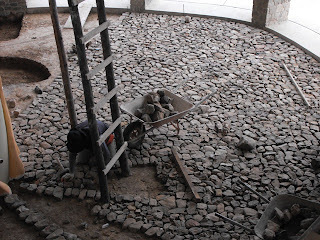 Gradually the floor was completed in sections. We experimented with several different colour combinations when it came to painting the column. We had liked the pure white of the plaster but the column disappeared against the white lime washed walls. Then we tried some tree colours, an olive green and a warm wood colour, but they made the column look like a fake tree - not the effect we were after. 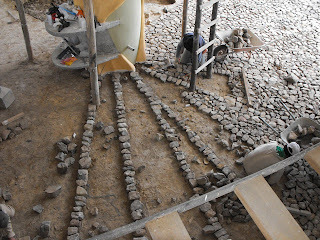 In the end we took some subtle colours from the stone columns - grey and cream. 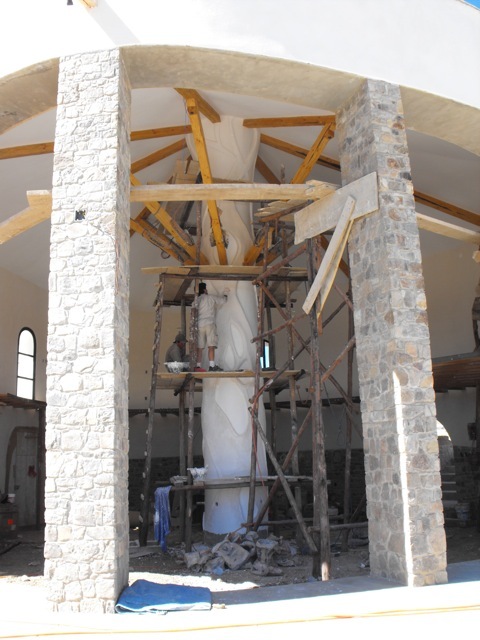 Finally we were ready to start taking down the scaffolding platform and reveal the column. Ed has to use the chainsaw to cut the main posts that were buried in the ground. 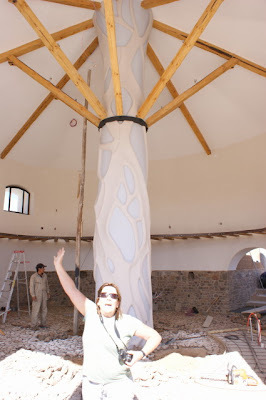 ....and Ed can't resist hugging our tree sculpture. 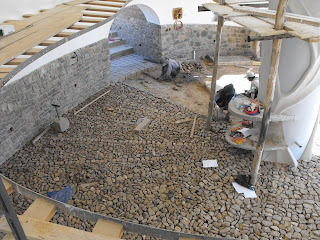 That evening we were able to see the roof lit for the first time. A great night view of the column from outside. 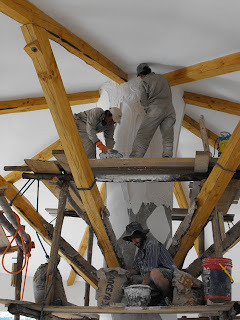 When we started building the living room the column was constructed to support the huge roof. 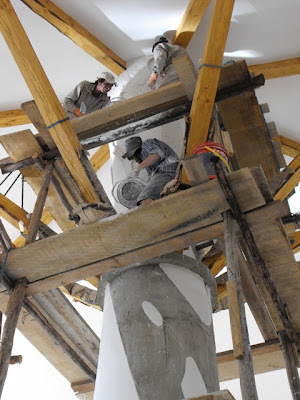 We used the same technique we had employed to line our well - rings of concrete that were strong but pretty ugly. 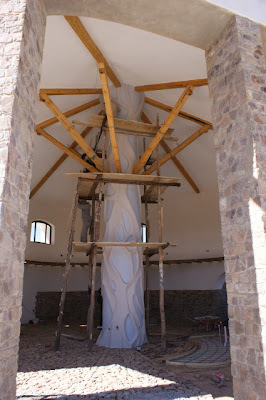 When we were sailing in Honduras we had seen cut trees used as palapa supports with vines growing up and around the trunks and we decided to use this idea to 'dress' the column in the form of a sculpture. 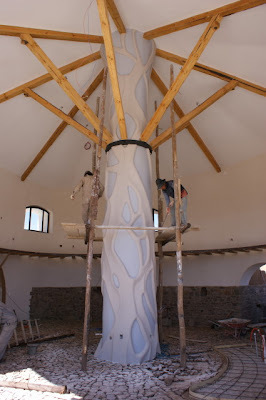 A huge structure was erected around the column to act as a work scaffold, then Ed marked out the shapes where the 'vine' would come into contact with the 'trunk'. The flat surfaces of the trunk were plastered. 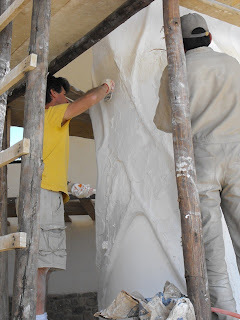 Next Geronimo and Honorato started building up the layers of plaster that would form the vines. 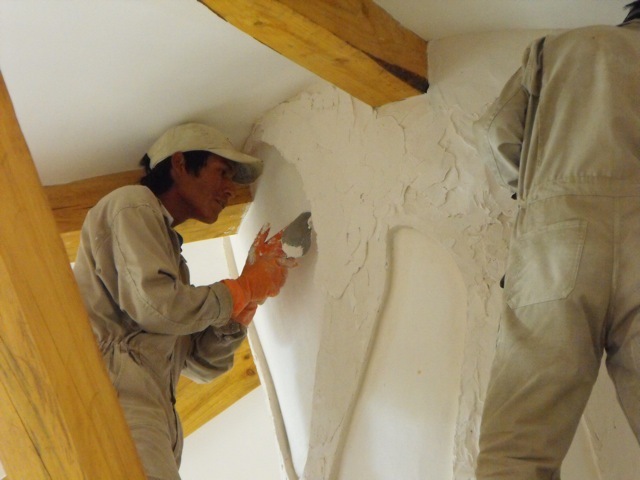 They had never done this kind of work before and were enjoying their new role as artists. 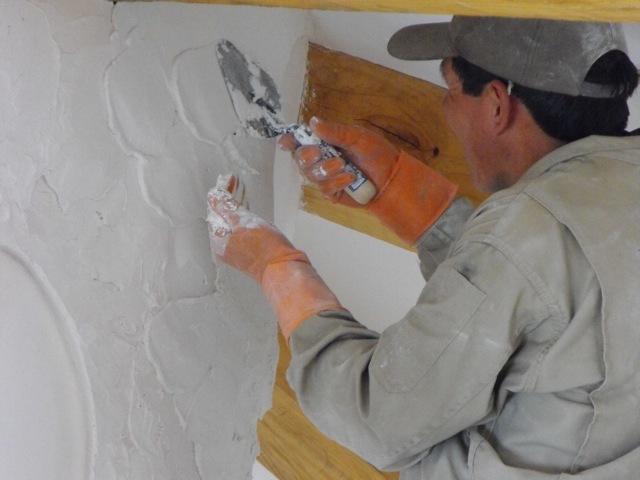 They were assisted by Paul, a volunteer from Workaway who mixed the buckets of plaster on a platform just below. 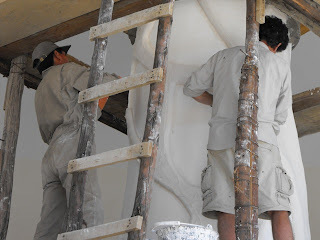 The layers are built up very gradually. Geronimo uses his hand to hold the plaster which is then transferred to the column and smoothed out. 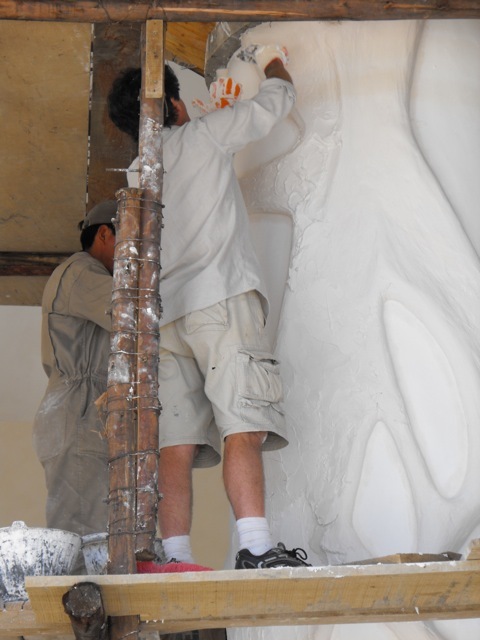 Once the layers are of a sufficient thickness Ed joined the team to round out the plaster and form the vines. Although June had been game for lime washing the interior walls of the single storey section of the Roundhouse, when it came to the living room she handed over the paintbrush to Ed. 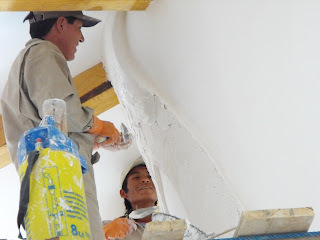 The job required balancing on planks propped up on Bolivian style scaffolding and having a strong head for heights. 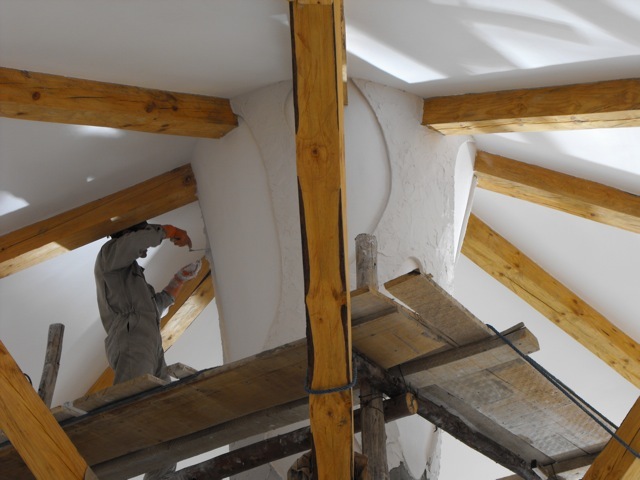 The creamy white lime wash made the living room appear even larger than before. Above is a photo of the door to the terrace and the two colonial style windows modeled on those of a tapas restaurant in Sucre.